The largest ever recorded dead zone in the Gulf of Mexico is developing right now, and is expected to cover more than 8,200 square miles. Dead zones are caused by nutrients flowing into waterways, rivers, and ultimately, the ocean, from agriculture and wastewater; in conjunction with sunlight, nitrogen and phosphorus stimulate an overgrowth of algae. The algae then decomposes, resulting in a lack of oxygen in the water, and causing marine life to retreat or to die. Imagine a watery desert, with no living creature for 8,200 square miles – or worse, a graveyard populated by the floating bodies of fish and other creatures – an area the size of New Jersey. There is one primary source of these nutrients: the highly industrialized and intensive agricultural practices along the Mississippi River watershed. Soils are depleted by the enormous feed crops of corn and soybeans, and a common practice to achieve good yields in the absence of crop rotation or organic practices is to apply phosphorus and other fertilizers. Over-application isn’t only the province of farmers – home gardeners are seduced by promises such as, “Stimulates root development. Promotes larger, more beautiful blooms and fruit.” We are all susceptible – nutrient pollution is one of the world’s most widespread environmental problems. And yet, as bad as this dead zone is, it may not be the worst of the possible consequences of phosphates; that dubious honor is reserved for the mines and processing plants, and the communities that inherit their enduring legacy of contamination. South Mississippi is one such place. The EPA assumed temporary control of the Mississippi Phosphates Company in February 2017, two years after the plant ceased production in December 2014. The $12,000,000 trust established for cleanup ran out in 17 months. It was an amount wholly inadequate to address the 100’ tall gypstack, the by-product of fertilizer processing. In addition to the gypsum mound (a radioactive powder that cannot be recovered for construction or any other practical use), there are 700 million gallons of contaminated groundwater held on-site, in ponds and ditches, glowing lurid and unnatural colors from aerial viewpoints. The site is so large that a single inch of rainwater creates 9 million more gallons of rainwater that must be treated before it is released to the Gulf of Mexico, and last month, the area experienced 10 inches in a single day. The EPA was forced to intentionally discharge wastewater in advance of the heavy rains, known as a bypass, because the resulting runoff would exceed storage capacity of the wastewater treatment system. This discharge wasn’t the first; since 2002, there have been a dozen emergency bypasses, with deadly consequences for wildlife in Bayou Casotte. In 2013, the plant discharged 38 million gallons, causing the death of 47,000 fish. In 2014, the plant discharged oily wastewater to create a 1 mile sheen along the bayou. There have been hundreds of violations of the Clean Water Act. The site can treat 2 million gallons a day by reducing the nutrients, reducing the ammonia, and adjusting the pH before release. However, with 60 inches of rain a year, it is hard to keep up, and the capacity to hold more is limited by the height of the levees surrounding the settlement ponds. There is currently about 2.3 inches of freeboard, but the target to avoid future bypasses is 10.2 inches. The U.S. is the world’s leading producer of phosphate fertilizer, creating 37% of the world’s supply from ten mines. There are Pliocene-age sedimentary deposits in the eastern U.S. in Florida and North Carolina, and Permian-age shale deposits in the western U.S., in Idaho and Utah. Even so, we are now a net importer of the mineral, from the other four countries where it is found. The manufacturing process requires treating phosphate ore with sulfuric acid piped in from the neighboring oil refinery, then heating it to drive off water. Ammonia is added to create the nitrogen-phosphate blend used for agriculture. Each of these steps leaves behind a nightmarish environmental cocktail that affects air quality (the plant has released an estimated 10,000 lbs of ammonia into the air), soils (besides the gypstack, there are traces of radioactive cadmium and other heavy metals), and groundwater. Remediation is a long process, but if the EPA succeeds in adding the plant to the list of Superfund sites, there is some hope of improvement. There are phosphorus-sorbing materials, biomass-derived materials (rice husks, wheat husks, banana skins, bagasse, corncobs, bark, and agricultural waste), which reclaim the phosphorus for re-application. There are membrane purification systems, but these are limited to municipal water systems, and can’t effectively restrict the quantities of phosphorus at sites like these. There are microorganisms (bacteria, yeast, fungi, algae) that force the biomass to consume more phosphorus than is generally needed for growth. The mounds can also be capped in place to reduce the potential for rainwater infiltration and the resulting contamination. 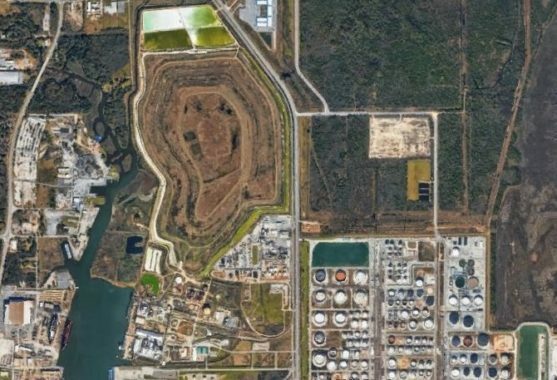 There are 400,000 acres of phosphate mines in Florida, in an area known as “Bone Valley,” that need remediation; one billion tons of phosphogypsum stacked in 25 stacks. Thirty million tons are added each year. There are simple solutions to this problem. Use fertilizers sparingly and correctly. Don’t leave soils fallow, a practice that causes erosion and runoff. Create riparian buffers to intercept excess fertilizer. Eat less meat, as the bulk of fertilizers in America are used on feed crops. Improve the regulation of industry and increase the required cleanup funds, so that companies can no longer walk away when a site is no longer profitable. If the price of a 4 lb bag of Triple Super Phosphate goes up as a result (it’s currently available for $19.99) then the true, environmental cost of that green lawn is being borne by the consumer, instead of subsidized by the public.